Food, energy, and people are all linked by water. Decisions and actions in one area typically have impacts on one or more of the other sectors. There can be cascading impacts, both positive and negative, onto other parts of our society including the economy, our health, and even politics. These many connections are the reason why decisions in the Water Nexus are so complex. Lowering the water level in a reservoir to produce extra electricity or to create space for flood mitigation can limit the tourism that depends on that river or reservoir level and impede local recreational activities. Government programs promoting water-conserving crops may decrease the value of a farmers’ harvest which can mean less income and investment in the local rural economy. This decision can impact the volume and type of food reaching local and global food markets. Incentive programs encouraging energy or water conservation can stimulate development of new technologies and industries, which help diversify the provincial economy. An increased global demand for biofuels can alter the types of crops being planted and increase the price of certain foods so much that they become un-affordable. A flood in a community might be mitigated by changing the flow rate through a hydroelectric dam but this could reduce the amount of energy generated by the facility. Constructing a hydroelectric reservoir can negatively impact aquatic ecosystems by changing the river flow and creating a barrier to fish migration. That said, in some cases, dams have preserved native fish populations from aquatic invasive species and reservoirs have created recreational areas for people. Mining the raw materials needed for building more solar panels to conserve water used in energy production may degrade wastewater and disturb ecosystems. Everyone and every sector in the Alberta Water Nexus shares a common water supply. This supply is limited, and quality and quantity vary on a year by year basis, making it especially important to plan in advance for how to share the water. It can be challenging to ensure there is sufficient water for the environment, something we know benefits all sectors. A key tension in water management often arises when there are water shortages and the need to protect sensitive aquatic ecosystems becomes a priority over other uses. By ensuring legislation protects environmental flows to meet ecosystem needs, and only making ‘surplus’ water available for human uses, the ecosystems are maintained even during a drought or low-water situation. Competing water demands can occur at any time, but let us consider an example during the summer months. The environment, which acts to clean our water and provide economic and recreational benefits, requires specific levels of high-quality water flows. The food sector requires water in the summer to irrigate crops. Municipal water demand for watering gardens and pools increases in the summer. Hydro power plants require large volumes of water in the summer to meet high electricity demand when air conditioning units are in use. But often there is less water flowing in the river due to low precipitation during the summer months. In times and areas of water shortage, these competing demands result in water management challenges and sometimes restrictions. In particularly low flow years, important decisions need to be made regarding which users get access to water. How do we Balance the Nexus? Due to the complex and interconnected nature of the Nexus, a collaborative approach among major water users and stakeholders is necessary. Establishing and maintaining relationships between sector decision-makers is particularly valuable in times of water shortages, but may also result in leveraging opportunities that benefit multiple sectors. 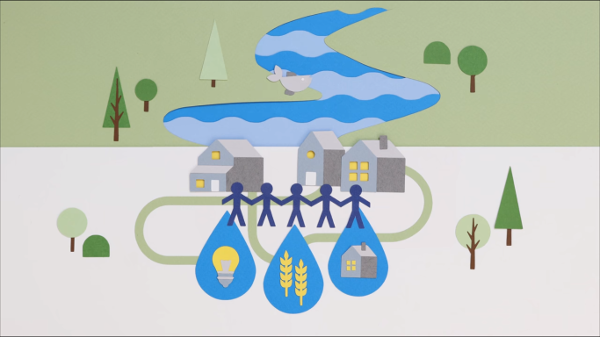 Decisions and actions that individuals make, such as how much water they use, and what products they buy collectively create the water and energy demand and the water management policies across the province. Decisions that communities and municipalities make can affect water use through by-laws, including restricting the use or type of water for landscaping. Decisions that the provincial government makes in creating policies relating to energy and food production, and therefore how much water is used for those activities. Supporting the positive feedback loops of resource conservation. In some cases, saving water in one sector can lead to water savings in another sector. For example, if households run laundry machines less often, households save water and the energy sector would need to use less water to produce electricity. As another example, if people used rainwater collection for outdoor watering and cleaning, less water would be needed from the tap. This means that municipalities could treat less water, which is an energy-intensive activity, further reducing water use in the energy sector by requiring less electricity for water treatment. Integrating systems. Increasingly, energy and food systems are becoming integrated by installing wind, solar or geothermal energy on farmland. This provides farmers with an alternative source of income, meaning that they can try to grow alternative crop varieties that require less water and land. Individuals making informed and responsible decisions. Individual actions and decisions, at home and in your community, determine the demand for water, energy, and food. For example, if homeowners replace all their home appliances to energy and/or water efficient models, and use those appliances less often through planning and efficiency, demand for both water and energy can be reduced in multiple ways. The many connections in the Nexus make it challenging to balance, but this also offers many opportunities for cooperation and for strategies with multiple benefits. Balancing the Nexus is an ongoing process that does not have any straightforward solutions. Strategies to conserve water in one sector will likely have positive and, potentially, negative repercussions in other sectors. It is necessary to consider a broad range of perspectives to find ways to mitigate any negative impacts. Ultimately, these solutions will allow us to more sustainably manage our water resources.